Let’s be honest. Whether you’re a debut author or a seasoned veteran, there’s always a slight fixation on the numbers. One of the few places that you can glean understanding is from the Amazon Rankings system. Is it perfect? Definitely not. Does it account for success in Indie stores? Nope. Might it be a bad barometer for someone whose book Barnes and Noble decided to back in a huge way? Or Target? Of course it might. 8. Last but not least… Leave this if it isn’t useful. Honestly, if this stresses you out. Don’t look at it. Don’t worry about it. Write your books. Enjoy not looking at any of this. I am a very strategic person. I’m a numbers junkie. I 100% love to know how things work, and where I stand within the larger system. It’s just how my brain functions. So I want to know how all of this operates, and what the numbers mean. You might not. As with ANY writing/publishing advice, I’d encourage you to take what’s useful, and leave what’s not. 1. Ranges- This is not full proof, but I have figured out a few ranges that exist on Amazon. If your book is in the 2,500-5,000 range for a week: you could expect anywhere from 500-750 book sales on Bookscan. 5,000-15,000 range would be closer to 250 that week. 20,000-30,000 is going to land you somewhere in the 100 range. I think anything beyond 50,000 should give you an indicator of 50 or less sales that week. Of course, this depends on your other activities. If I’m visiting a school or attending a festival, I might see these fluctuate accordingly. 2. How do I know I’m in bestseller range? Again, this is for young adult books, not for MG (which rely more on library sales) and not for adult (which has a much higher threshold to hit the list). After watching this for a long time, I think you have to go sub 1000 in Amazon’s rankings to hit the list. Again, this is not a flawless indication. Someone who’s backed by Indie bookstores in a really big way? They might have a weaker ranking and still hit the list if they’re moving a ton of copies through other mediums. It’s also dependent on the week. There are weeks in the year where you need to sell 2,500 books to hit the list. There are other weeks where you can slip on the list with 1,200. It just depends on what else is coming out. This week, Tomi Adeyemi’s CHILDREN OF BLOOD AND BONE actually hit #1 amongst all books on Amazon. It sat in the top ten all week. She will absolutely hit #1 on the YA list. I’d actually guess she’s moving anywhere from 20,000 to 40,000 copies this week. That’s significant, because week to week, I think the top book might be selling 5,000-10,000. If you haven’t read her book yet? What the heck are you waiting for? It’s brilliant. RESTORE ME by Tahereh Mafi has been in the top 500 all week too. I’d guess it crashes the YA list at #4 or #5 (behind Tomi, Angie Thomas, and John Green). There are two other books that I’ve been watching. One has been in the top 1500 pretty much the whole time. Another has stayed around the 2,000 mark. Either one could sneak onto the list at the 9 or 10 spot, but it’s a really competitive week, so it’s possible neither does. We shall see! 3. When is the best time to check these rankings? So I’ve seen days where my sales ranking fluctuates wildly. I’m not sure if Amazon has written about how these work, but some days I’ll see my ranking start the day at 18,000… before falling all the way to 72,000. But when I check the numbers the next morning, that “day” of sales is listed as 28,000. Again, I’m not fully certain, but it feels like you can see the “average” ranking of your book across that day when you look at it the next morning. 4. What’s the deal with these obscure categories? This book is the number one book in “Mysteries about Farmers”… What?! Our debut group has debated this pretty hotly. It’s assumed that the publisher can make some requests regarding which sub categories a book can be listed under. We all have noticed that the little orange tag that says #1 Bestseller in… that obscure category is a positive thing. It seems publishers and authors want that status because it does offer a slight “hey look at me” to anyone surfing around Amazon. 5. Is there such a thing as a Twitter bump? Your favorite author just shouted a debut author on Twitter. What the what!? You have to go check them out! Except Twitter’s not great about getting people to follow links, and it’s not guaranteed to move more books. I followed someone’s numbers after a shoutout by John Green. Dude has some 5 million followers. Has to increase sales right?! Not quite. The Amazon numbers fluctuated slightly, and were lower the next day. Note: It might, however, be more impactful at the indie level. If a bunch of librarians and booksellers follow John Green, they might be inclined to take his advice and write that book title down, so they can check it out at a later point. ALSO, there’s a slight difference between a quick shout out and continual backing. I have noticed that a big named author who talks up a book for months? That can have a serious impact. 6. TV Bump! – Obviously we can’t control being on TV, but that is clearly the biggest impact in sales jumps on Amazon. I’ve seen massive boosts to authors who appear on mainstream television shows for interviews. I think this might be a “duh” point, but it has clear-cut traction that Twitter shoutouts just don’t demonstrate. 7. Remember that the NY Times List is… bizarre. If you don’t already know, there are weeks when someone clearly outsells someone else, but the rankings don’t fully line up with the Bookscan numbers. This is, in part, because Bookscan isn’t fully accurate. It usually reports around 70% of sales for a week. So there’s room for error, and room for a book to be significantly boosted by a book tour, or Indie attention, or whatever. But there’s also some mystery behind how the NY Times makes it selections, and in that mysterious space there’s room for all of what I’ve said here to basically not matter. Sometimes the list shakes out in a way that seems to defy the numbers. It happens. 9. Things not covered here: Kindle sales. I haven’t followed these closely. The one thing I’d say about Kindle sales… A high ranking CAN indicate successful crossover. If a book is constantly in the top 20,000 or so, that means a lot of adults are reading it. That’s something to note as you weigh who is reading your book and who isn’t. I also haven’t mentioned Penguin Random House’s author portal. Apparently other houses don’t have something like this, but we get a specific, day by day update of sales. I think it’s delayed by a week or so as the numbers report, but it’s kind of amazing that we get such an insightful look at our numbers. I always compare those to my BookScan numbers to figure out how my book is really doing. Anyways. I hope this was super helpful. Let me know if you have questions! Also, if you learned something from this article, consider making my Amazon numbers jump and buying Nyxia, my debut novel. Thanks for reading! Revisions: One to polish the initial draft for submission. One with my agent’s advice. One big editorial revision with my editor. A second edit with a particular editorial focus. An edit to incorporate feedback from sensitivity readers. First pass pages. Second pass pages. Nervous, debut author pass pages. That’s 8 revisions. The longest of those revisions (the big editorial one) took me 14 days. The shortest (second pass pages) took a day. I’d guess that I logged about 2 months of writing time on these revisions. Most Difficult Moment/Experience: Learning how to yield to an editor. I was very headstrong at the start of this series, and I’d definitely say that I reacted stubbornly to a handful of very necessary edits. It all turned out well, but that was my hardest lesson. First Draft: Wrote this one in three months. 90,000 words. Revisions: Standard polish revision on my own. One to incorporate feedback from beta and sensitivity readers. Huge editorial revision. My editor really disliked the central conflict in the story. Rewrote almost the entire story. Editorial revision with minor notes. First pass pages. Second pass pages. That’s 7 total revisions for the book. All in all, I’d guess that I spent about 4 months on the edits. It was basically like rewriting the entire story after all. Percentage of Changed Material: I’m not kidding when I say my editor really didn’t think the first draft worked. I reworked about 90% of the novel. I’d say that I produced 80,000 new words for the revised manuscript I sent her eventually. We both loved that version, so it worked out, but that didn’t make the first swing-and-a-miss any easier. Most Difficult Moment/Experience: Learning not to take editorial feedback personally. My editor really leveled me with that first response. And she wasn’t wrong. The story didn’t work, at least not as well as I thought it did. Better was out there for me. We got to redirect the story and now the final product is so much better. There was still about a three day stretch where I questioned my writing ability. First Draft: Wrote this over 6 months, but I also began writing it in the same month that I had my first child. This January I’ve written about 42,000 of the 90,000 words. Percentage of Changed Material: Please be less than book two. Most Difficult Moment/Experience: So far? I’d say the weight and burden of finishing. This is not the end of a book. It’s the end of a story. The end of every character arc. I usually have no problem leaping into a story, but I’ll admit that I hesitated on this one. The task felt quite insurmountable. We’ll see if this holds up as my most difficult moment! And every single one of you can say, “Well… according to this blog post… you’re not quite done.” Slag that. Thanks for reading! Giveaway ends February 18, 2018. I just wanted to give everyone a heads up that there’s a Goodreads giveaway happening. I have three signed copies of the book going out to lucky winners. So we pitched even more title ideas. Brainstorms like you wouldn’t believe. I went through thousands of poems to look for little turns of phrase. I rooted through old ideas and names of characters and possible world building terms. Of course, there was one little concept that was incredibly central to the book that we had overlooked: nyxia. It was already included in the series title “The Nyxia Triad” and we knew nyxia was going to be an ongoing and developing piece to the story as a whole. It’s a substance in the book that the company– Babel Communications– wants more of. They’ve hired the ten competitors in the novel to go to a distant planet to get it. And those competitors spend a good deal of their time aboard the ship learning how to interact with and use the mysterious substance. In fact, the team went into one of their meetings with this as a backup option. So when the first title/cover lost steam, they put this one in front of everyone instead. It was an immediate hit. Sales and marketing both loved it, and we had a definitive winner. But I also get the “last say” on covers– so my editor sent it very hopefully in my direction. And I loved it. It has the same swirling splash as the cover before it, but this time, we have a font that really is more minimalistic. It seems very appropriate and fitting for the space that it’s inside. It also is just gorgeous. That Y in Nyxia is one of my single favorite letters that exists in the world. I also love that we had gone back to hinting at science fiction. So we were done… right? Not quite. You see there are always little tweaks and adjustments to the final package. One of the biggest criticisms of this title was that it is a word people don’t know. That can work, and it has worked, but it certainly was something that the entire team had to weigh. So that “Every life has a price” tag that we had loved for quite some time, well, it got called into question. How do we adjust for the fact that our title now involves a word the reader won’t know? Let’s see if you could spy all the tweaks. The first one has to do with color. See how they made that interior circle (the little glimpse of space) darker? So the contrast, and the splash, and all of that are just a lot sharper in the newer version. It also makes that glinting star in the distance a little more… glinty. The second change is in the tagline. We went with: The Ultimate Weapon. The Ultimate Prize. Winner Takes All. 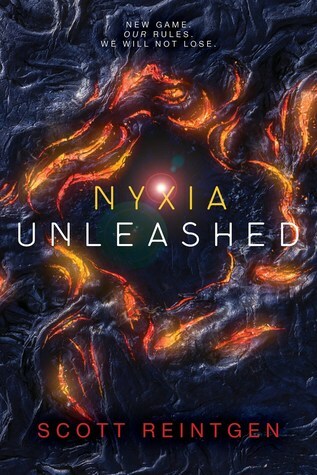 So if the reader is looking a little closer and thinks, “What the heck is a nyxia?” Hopefully there’s some definition right there on the front cover. It’s obviously a weapon of some kind. It’s also seen as a prize in some way. Finally, there will be some kind of competitive occurrence that connects back to it in some way. And last but not least, they added the wonderful blurb that was provided to me by the brilliant Marie Lu. Definitely not a bad quote to have floating at the top of your book for the rest of forever. Or you can just go find a copy at a local store and take a look. The final touches that they used on that final cover are gorgeous and definitely worth a second look. Thanks for following along, and I hope this has been educational on the process used to arrive at a “final cover” for a book. I might write a follow up that features my UK cover, which was a much more streamlined/quick process. Thanks for reading! So you can read part one here: https://itspronouncedrankin.com/2017/11/20/the-progression-of-a-book-cover-part-one/ (or just scroll down). We’re talking book covers this week, and I’m specifically walking back through all the titles/covers we had for what eventually became Nyxia. The cover on part one was for the title The Black Hole of Broken Things. I talked a little about the positives and negatives of that cover, and about the importance each internal team plays at a publishing house (sales, marketing, school/library). So that cover got thrown out and I started another round of coming up with titles. I sent a list over to my editor, and kind of didn’t think anything would hit. To my surprise, she landed on the phrase Iron Sharpens Iron. This phrase pops up in the early going of the story. Marcus Defoe alludes to it as Babel’s “method” for how they want to train the contestants. They believe in a sharpening process. Iron against iron to make the blades sharper. Emmett reflects on this idea, too. He concludes that at the end of the competition he’ll likely be “harder and sharper and more dangerous than I could have ever imagined.” For those who aren’t familiar, it’s also a pretty direct shout to a verse in Proverbs that says, “as iron sharpens iron, so one man sharpens another.” I’m not sure how aware of that my teams were at Penguin Random House, but I grew up with that verse all but inscribed on my bed frame. I was genuinely surprised (and thrilled) by the idea of it being the title of my first book. Once more, the colors. But unlike the first one, these aren’t so absurdly explosive. Really it’s that translucent, ethereal nature that drew me in. I love how the “softness” of the color juxtaposes with the “sharpness” of the stone and the blockiness of the letters. It’s a great effect. The “floating debris” is meant to be nyxia. Really great job of centering an image from the book in a way that makes sense. The 3-D nature of it is really cool. My agent even remarked that she thought this was a very “new idea” in terms of covers. We agreed it was doing something we had not quite seen in the YA industry, and that’s always (sometimes) a good thing. I actually loved how the font kind of folds into the landscape. I also loved how “The Nyxia Triad” snuck into the “I” on the second IRON. What didn’t we like about it? Nothing. I had no suggested changes for this cover. So why isn’t this the book and cover and title that landed in your inbox? Why didn’t you read Iron Sharpens Iron by Scott Reintgen instead of Nyxia by Scott Reintgen? Remember, each section of your publishing team matters. Marketing is going to figure out all these great ways to pitch the book to the public. Sales is going to be figuring out the best avenues and places for the book to be sold. School and library are doing their very best to gain traction with librarians and teachers and students. In this instance, one of those teams was a big no. They just did not really get the title. What did it even mean? What was the point of it? What did it say about the overall story? After a pretty long debate, it was clear that this team just wouldn’t be as on board with the project if this was the title and the cover. And you know what you really, really want when you’re publishing your debut novel? You want every single person in-house to be on board, and excited to throw your book in every direction imaginable. I think you see where this one is heading, don’t you?! We have that backdrop splash making its very first appearance. Some of the leftovers from the last cover are there, too. I’ll admit that I really, really hated this one when I first saw it. I just felt like the font was so massive coming out of that much more elegant splash of nyxia, and it looked cluttered and sloppy and just meh. It was the only time in the whole process that I sent back a strong no. I did love the little roses and flowers wrapping around some of the font, but thankfully… this is not where the story of my cover ends. Stay tuned for round 3. I’ll discuss the final cover, and why every team was so satisfied with our final iteration. Cheers! After a solid round of voting, the masses have spoken. You wanted to see a post that covers the sequence behind how a publishing house settles on a particular cover for a book. As many of you know, my first novel is entitled Nyxia. It’s the first in a science fiction trilogy, and I’ve had an amazing three months celebrating it’s release into the world. But it wasn’t always called Nyxia. I’d like to take you step-by-step through the various covers we saw for this project, as well as the general discussion that happened around each version. Let’s dig in. So the first title for my book was The Babel Files. On some level, that is always going to be how I think of this book in my head. Long before any other human ever set eyes on my book, that was the name of the document I had in Microsoft Word. The first title discussion happened after I paired up with literary agent Kristin Nelson. We talked about that title and there were two particular factors that went into changing it. First, there’s a relatively popular series by Jay Kristoff and Amie Kaufmann that’s entitled The Illuminae Files. There’s no such thing as complete originality. After all, Brendan Reichs and I have discussed several times that the word Nemesis appeared in several books around his publication date. But my book was clearly shooting for the same market and space as Jay and Amie’s work. Having such a similar title felt a little self-defeating, especially when you want to stand out. Secondly, my agent felt it evoked The X-Files. Considering my book is not about aliens (or the denial of said aliens) we decided to go a different direction. And so the second title of the book was born: The Black Hole of Broken Things. We pitched the book to editors under this title. It comes from a line in the book where my narrator, Emmett, accidentally knocks the hell out of a fellow competitor. The line is: “I slide the gloves off and climb out of the pit, trying not to think about black holes and broken things.” It was a very narratively appropriate title. Emmett reflects several times on the idea of becoming a black hole. The idea, too, of being broken things in the eyes of Babel comes up. So we had a green-light in that regard. And it turns out my editor adored that title. So we were set. Right? So let’s talk about this one. I’ll admit to originally loving this cover. Let’s be honest, it was the first time I had EVER seen a work of mine made real through any kind of illustration. There was a cover. With my name on it. That was more than enough to satisfy me. The font of the title. As with the final Nyxia cover, there’s a certain strangeness to it that I felt was really cool and fitting of the story. It’s a great font, especially on those Bs in The Babel Triad. The colors. I still love the great sprawling purples and how strange it all looks. Did I mention MY NAME was on a cover of a potential book? Yeah. Awesome. It’s pretty on the nose in terms of metaphor. The contestants being sucked into a black hole in the pit of space? Kind of direct. The black hole itself, acting as an O, just looks a little strange and… sphincter-ish. Sorry if you’re reading this mom. Ultimately, this cover and title were rejected. Some of what I listed above factored into that. Several editors pointed out that this book appeals to people who don’t read sci-fi. It’s very focused on the characters and their relationships. It’s the kind of commercial book that they felt would appeal to a very wide audience (similar to The Hunger Games). So having a cover that is so distinctly a science fiction book has the potential to limit our audience. There are at least a handful of readers, our team felt, that would not pick this book up, even though they would have definitely enjoyed it if they had. Finally, the title itself was under question. Just to be clear, there are several teams that work on a book. There are sales teams and marketing teams and school/library teams. All of them end up having a say, because they’re all trying to figure out how to take a book they’re excited about and get it most effectively into the hands of readers. The Black Hole of Broken Things split those teams virtually down the middle. My editor– and many others– adored the title. They thought it was really original, and reflected some of the poetic writing in the book itself. Others found it to be a mouthful. Either that, or just a relatively confusing reference. What would potential readers even get out of that title? What would it mean to them? I’ll admit to some healthy skepticism as well. So when my editor reached out about changing the cover/title, I was more than happy to jump on board. I think I’d gotten to a point of feeling it was too long of a title. It just was a lot to say, and more often than not I’d share that title with folks in person and catch a kind of mixed reaction. Some people were intrigued. Others had to ask me to repeat it. So this one bit the dust. What do you think? Are there parts to the cover you like? Something you don’t like about the cover in general? How about the title? I’d love to hear your comments and questions about the process.